We are happy to announce the 2016 SeqAn user meeting supported by the CIBI (Center for integrative Bioinformatics), a member of of the de.NBI (German Network for Bioinformatics infrastructure). The meeting will take place at FU Berlin from March 30th to April 1st 2016. The SeqAn user meeting is addressing bioinformatics students and professionals who want to develop efficient applications for NGS analysis based on an efficient, well-maintained C++ library. 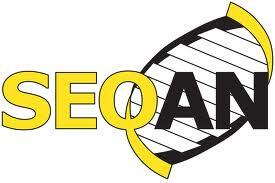 In the meeting you will hear talks from groups who actively use SeqAn in their daily work, you will hear about how some of the SeqAn apps work and how they were developed, and finally you get hands-on tutorials to get you started with developing your own SeqAn apps and include them into workflow systems such as KNIME. Please sign up using this form. The deadline was March 14th 2016 and is now closed. Room SR 005 (ground floor). Below you can see a preliminary schedule. Invited talk 2: IsomiR-SEA: A new powerful profiling tool reveals novel biological miRNAs and isomiRs features hidden in small RNA-Seq samples.